The political will is there, now we need action! The political will is there, now we need action! This was the message from the Leader of Sutton Council, Ruth Dombey, when we presented our Space for Cycling petition on 23 July. The petition, signed by over 400 of Sutton’s residents, called on Cllr Dombey to ensure that Space for Cycling was a priority for the council. It also asked her to support the efforts of those councillors, across all parties, who were trying to implement local improvements for cycling. 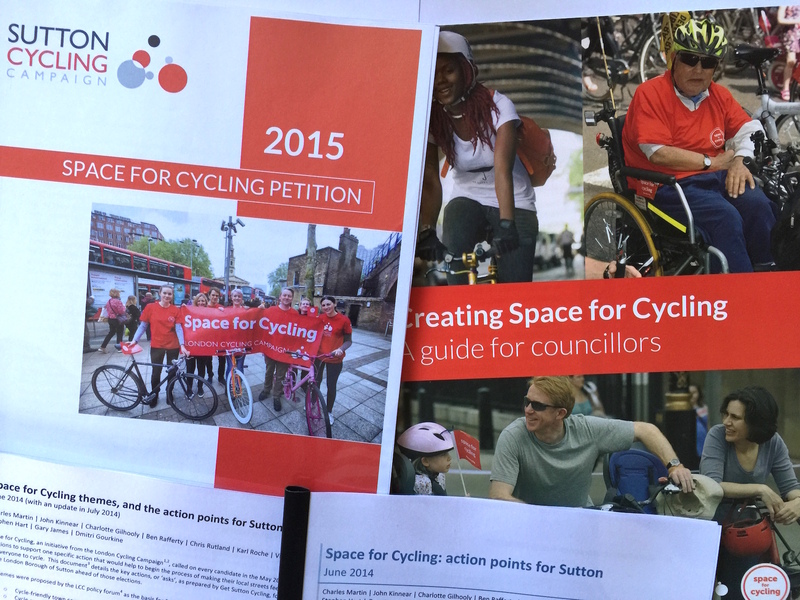 We, the undersigned, call on you to urge more of Sutton’s councillors to pledge their support for Space for Cycling, and join over 850 other councillors committed to safer cycling across London. 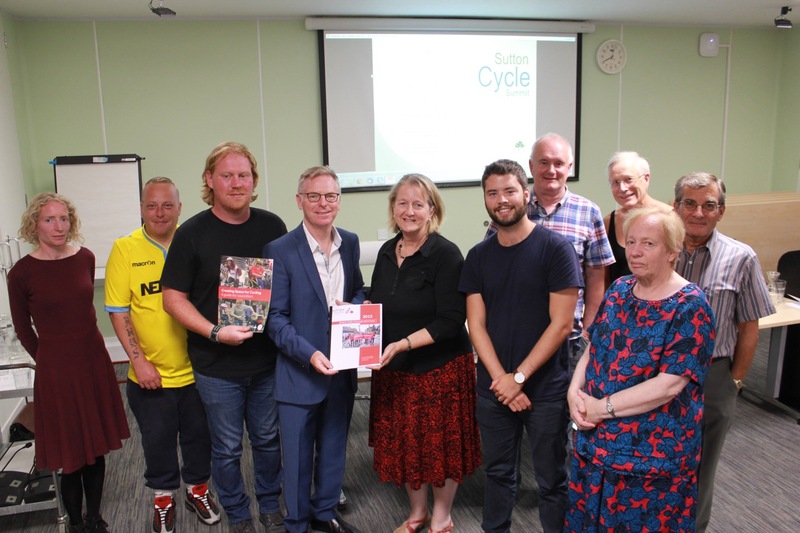 We also ask you to please support the efforts of councillors, across all parties, to take this work forward so we can begin to see some concrete improvements for cycling in Sutton. Similar petitions were being delivered to all council leaders across London during June and July, and we were pleased to learn that our petition had received the highest number of signatures of the 19 outer London boroughs. However, this was in stark contrast to Sutton having the third lowest level of support by councillors for Space for Cycling across London’s 32 boroughs. The petition handover was an opportunity to briefly discuss some issues around our disappointment with the level of support for Space for Cycling from councillors in Sutton. Political support is an essential requirement for the delivery of cycling, and we were concerned that there was a lack of political will within Sutton Council for cycling. Cllr Dombey said she agreed that cycling needs to be championed, but that it was wrong of us to suggest that there was a lack of political will just because she did not support our specific ‘ward ask’. She did support cycling, the council wanted to produce schemes that work, and our ‘ward asks’ as originally presented would not necessarily do this. There is political will, and Sutton Council want to produce schemes that work. In terms of support for the ‘ward ask’ in her own ward Sutton North, Cllr Dombey said this had not been given due to the possible impact that the construction of a tram route in Sutton may have. That surprised me, because although the provision of protected space for cycling on Rose Hill (the likely alignment of the tram) is mentioned in the ‘ask’, the primary request for this ward (and for some neighbouring wards too) is for a major, and long overdue, upgrade to the cycle path on the Sutton by-pass (A217 Reigate Avenue and Oldfields Road). It is unclear how the construction of the tram route would affect this. Given that the A217 is not under the control of the council, support for this major upgrade could be demonstrated by simply starting the conversation with Transport for London. Of course, should the tram in Sutton be given the green light, it would be a wonderful opportunity to fund transformative cycling infrastructure. But with construction not expected before 2030, we can’t really wait that long. I reminded Ruth that we been told in September 2014 to expect a review of our ‘ward asks’ within a month, and that, had we received this, we may now have been in a better position to understand why support by councillors for Space for Cycling was at the level it was. Ruth said she was sorry if nothing had come out of the September 2014 meeting, saying that resources had been difficult at the end of 2014. The appointment of Cllr Manuel Abellan, (Liberal Democrat, Beddington South) as Cycling Champion for the council, an announcement that had been made earlier in the evening, was very encouraging though, and Get Sutton Cycling look forward to discussing the issues behind the original ‘ward asks’ in more detail with him in the coming weeks. It was important for cross-party working on cycling issues too. Ruth agreed with this, and recognised the work of Cllr Neil Garratt (Conservative, Beddington South). Beddington South is the only ward in Sutton where all three councillors have shown their support, so this ward could lead the way for the rest of Sutton. Working together is a key message! It is also important for the final Cycling Delivery Strategy to taken into account at Local Committee meetings (an aspect that had been established in September 2014). The Cycling Strategy needs to feature during discussions that relate to transport issues, either directly or indirectly, and it needs to help influence the decisions that are made, however challenging that may be. The Cycling Strategy is, after all, a strategic document. Ruth agreed. Talking of strategies, I said there was some disappointment, that the Sustainable Transport Strategy, approved in March 2015, was still not available on the council’s website. Or if it was, it was not easy to find. How will Sutton’s residents, I asked, become aware of either the Cycling Delivery Strategy or the new Sustainable Transport Strategy that it complements, if neither is heavily promoted? I would like think that, in a few months time, if I were to ask a random selection of Sutton’s residents visiting any High Street in the borough whether they could name one transport related strategy that had been published by Sutton Council in the last 12 months, most would be able to give an answer. Ruth said that was not particularly fair as there must be many strategies and consultations that I don’t know about. Well, she is absolutely right of course. The big difference here, though, is that unlike the other current consultations – the Health and Wellbeing Strategy and the Sustainability Appraisal Scoping Report (both of which have links to cycling in terms of active travel or sustainable living) – the Cycling Delivery Strategy, if it is to successfully deliver the required outcomes, will require interventions that many people will initially, at least, quite possibly consider an imposition on their day to day lives. They won’t get it, and if they don’t get it, there will be no progress. And to be in with a chance of getting it, they need to be aware of it. We know, from looking at the letters page of any edition of the Sutton Guardian, or the minutes to any of the Local Committee meetings, that parking is a hot potato, and that 20 mph is a contentious topic, to name but two issues. So what will people say when proposals are put forward to close some residential roads to through motor traffic (but not bicycles), or re-locate kerb-side parking to provide space for cycling? Proposals that we know are essential, if cycling is ever to become an attractive enough, joyful enough, and easy enough transport option for most people. The Cycling Delivery Strategy needs to clearly detail “the why” and “the how”, and it needs to be highly visible too; otherwise it will be even tougher to successfully deliver what is best for future generations of Sutton’s residents. On behalf of Get Sutton Cycling, I would like to thank Cllr Dombey for agreeing to accept our petition at such a high profile event and for taking the time to listen to what we had to say. Ruth’s message to us was that the council supports cycling and, despite some reservations about the ‘ward asks’, was very keen to work together and move forward.